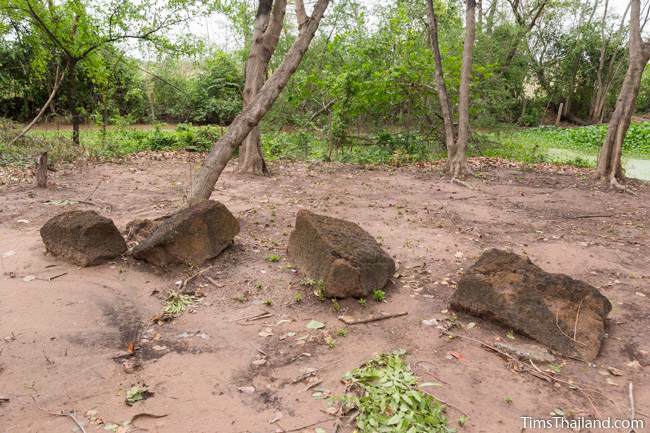 There are no ancient structures left at Non Thaen Phra (โนนแท่นพระ) anymore, just a few dozen scattered blocks, mostly laterite, laying around in the dirt plus a few sandstone carvings; and you probably can't see the later. 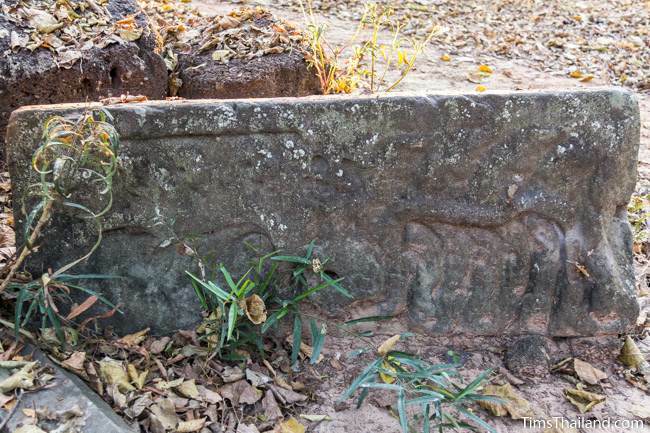 In or around 1914 a hunter chasing a deer found a Buddha image in the forest here. 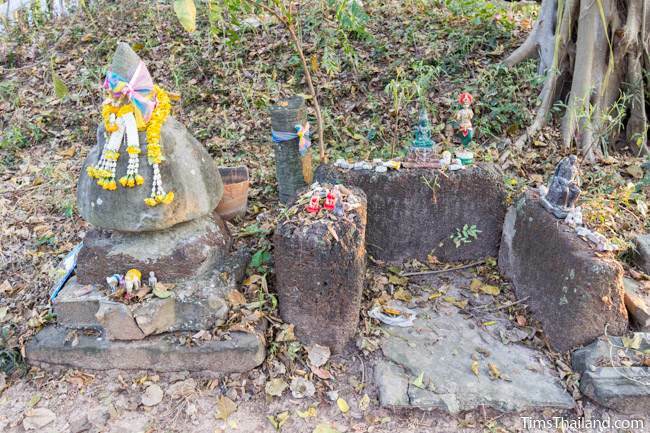 Later locals uncovered many more ancient artifacts, such as statues, pedestals, pottery, stone grinders, and a Shiva linga, and they developed Non Thaen Phra ("Buddha Pedestal Hill") into a shrine. 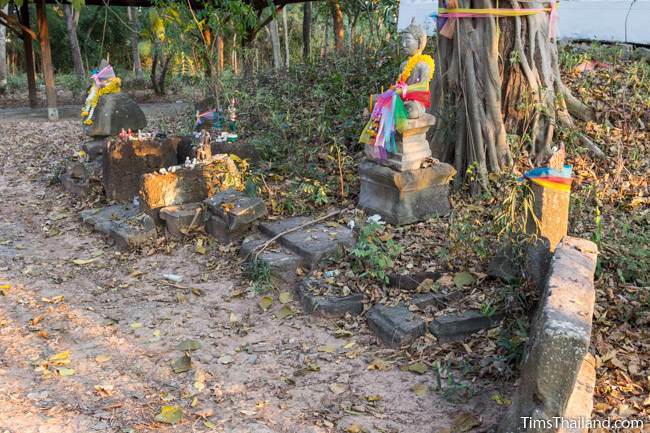 Most of these were taken away for study and safekeeping (some kept at a local school), but some things, including a lotus-bud top for a prang, and a lintel, were left behind and assembled into a shrine with a Buddha image. Photo of shrine from December 2014. Photo of lotus-bud top from December 2014. The heavily damaged lintel appears to have a kala head with garlands coming out its mouth in the bottom center and a small deity above it. It's too damaged to say for sure, but it's probably Baphuon style, which would place this temple in the 11th century, or perhaps early 12th. 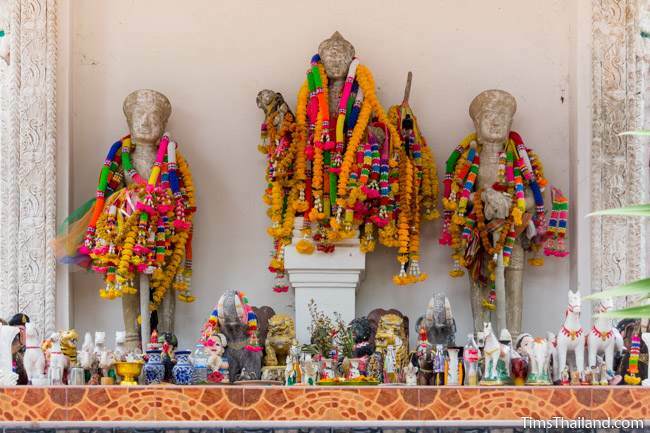 The Fine Arts Department says, "In the Khmer era, this community was probably an important city...the religious center of nearby communities," though they don't give a reason for this assumption. Photo of lintel from December 2014. A few years ago all the sandstone carvings were moved into a small red-and-white "museum." 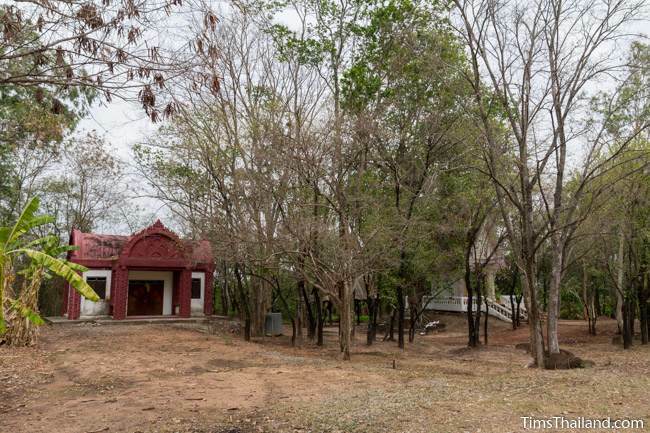 If you want to see inside you need to go the village, a kilometer to the southwest, and ask if someone from the temple committee (gam-má-gaan wát) will come with you and open the door. They don't allow the monks to have a key for this building. 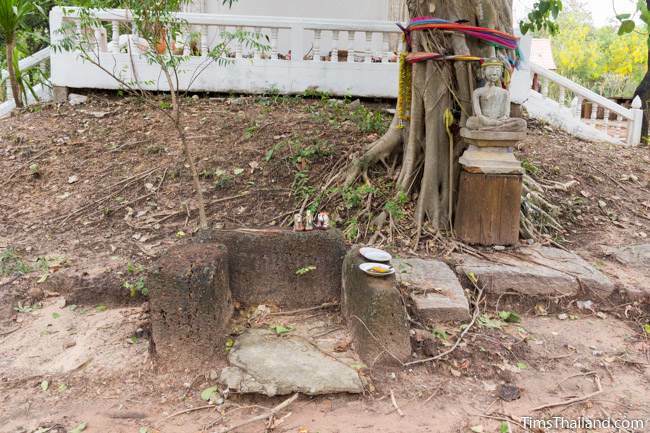 I won't repeat the story explaining why since I can't confirm it, but suffice it to say, there's no longer any trust or respect between locals and the temple abbot. For now, and surely some time to come, the committee is unlikely to let visitors in out of fear of theft. Of course, if you do visit here, it's worth asking the monks if the situation has changed and they now have a key. 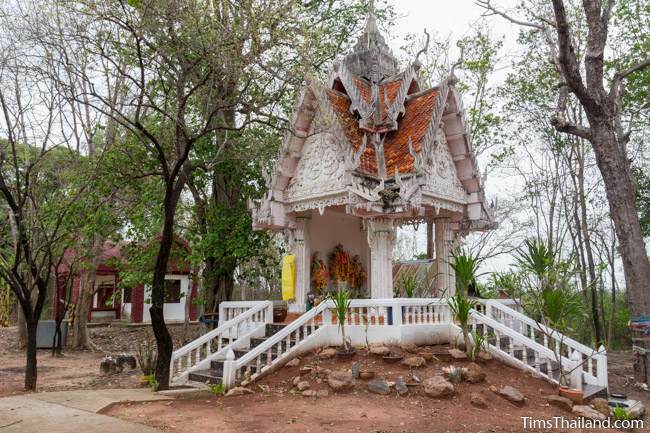 The main modern shrine on top of the hill, where most offerings are left, has three modern, Khmer style statues: a four-armed Vishnu and two sword-bearing dvarapala (guardians).